For those preferring something a bit more subdued before the noisemakers come out, here’s an idea table that just might fit the bill. 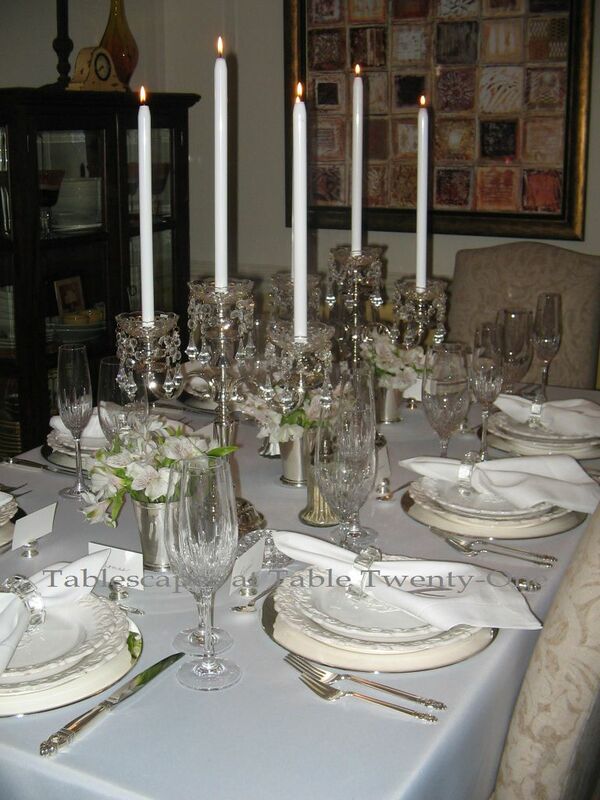 I am and always will be a sucker for a full-length white linen for most semi-formal and formal settings, unless you have a table with a pristine finish or interesting design. 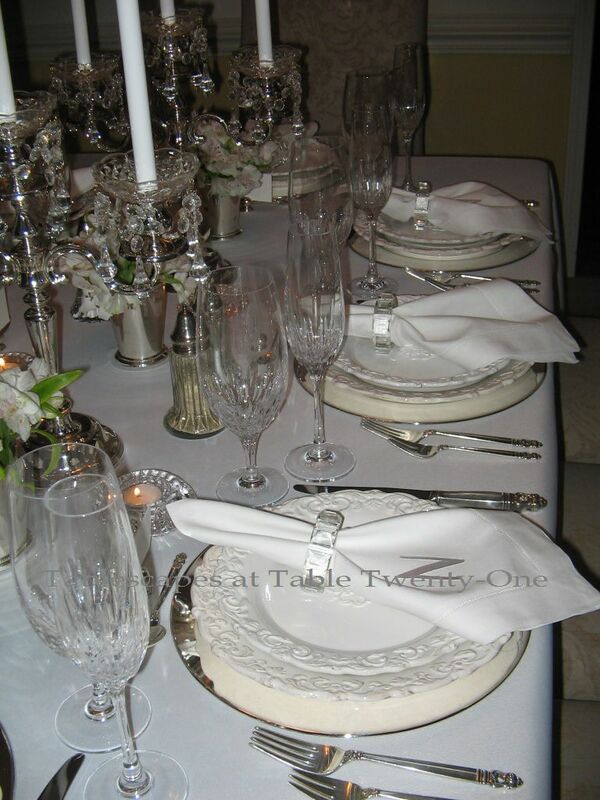 I used some of my favorite TJ Maxx creamy white dishes with scrolled rims atop the polished silverplate chargers, but just about any nice white dishes will do. 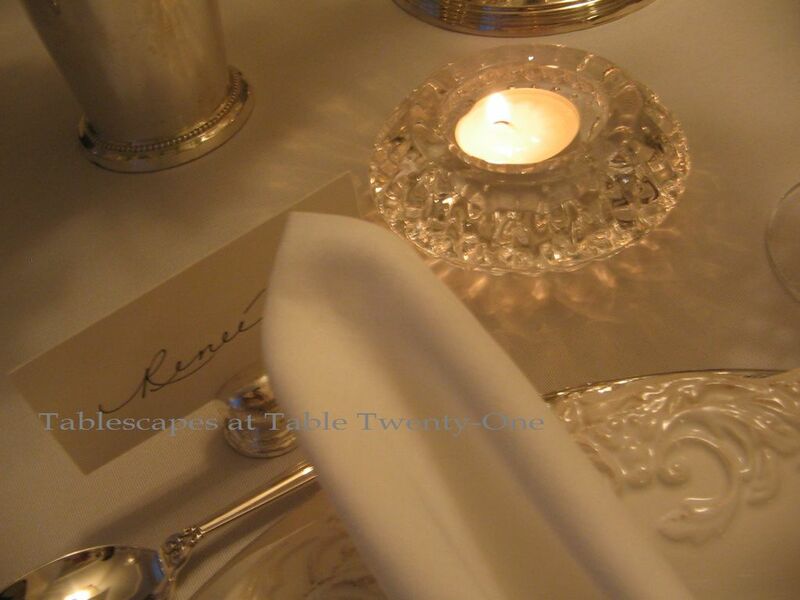 International Silver “Royal Danish” sterling flatware adds to the formality of the place settings. Godinger‘s “Chelsea” collection crystal stemware. 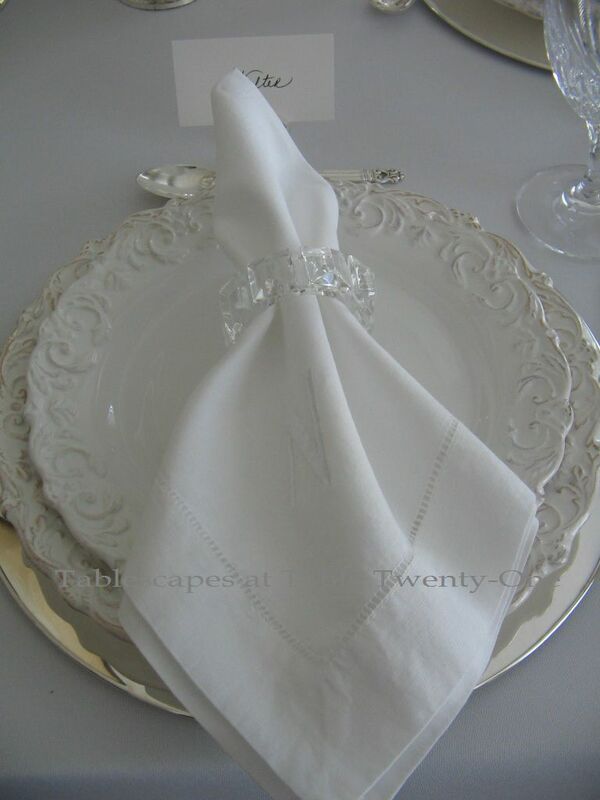 White linen napkins pulled through heavy crystal napkin rings from Z Gallerie‘s 2010 collection. 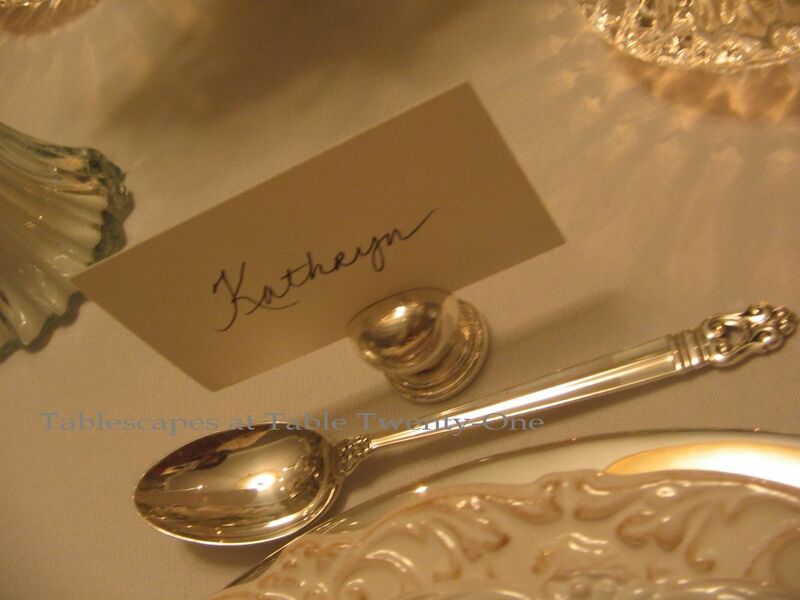 Simple silver spheres to hold place cards. 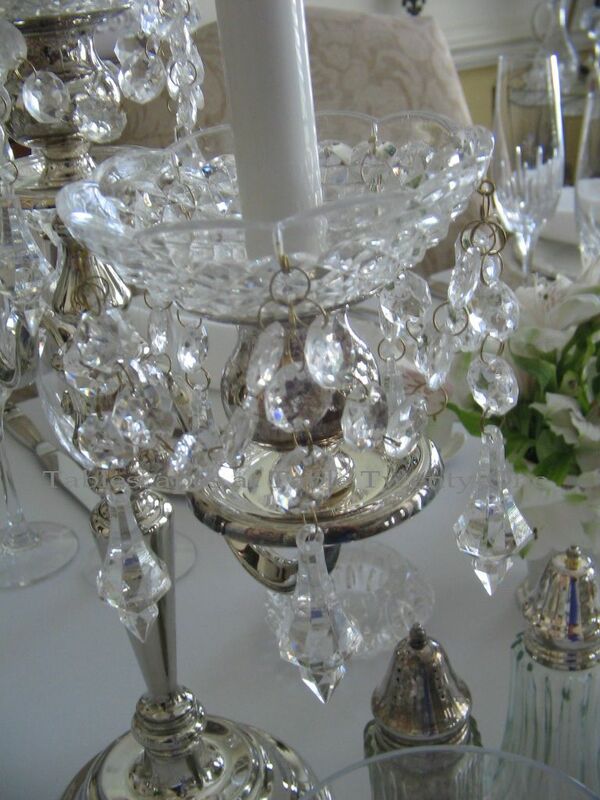 Reflective silver 14-inch, 5-branch candelabra dripping with crystal bobeches grace the center of the table. If you have concerns about fire safety like my husband does after THIS fiery fiasco last summer, reduce the risk by using metal case candles (also referred to as mechanical candles) such as these from Paradise Candles. Not only do they up the fire safety ante, but they save your nice linens from wax drips. 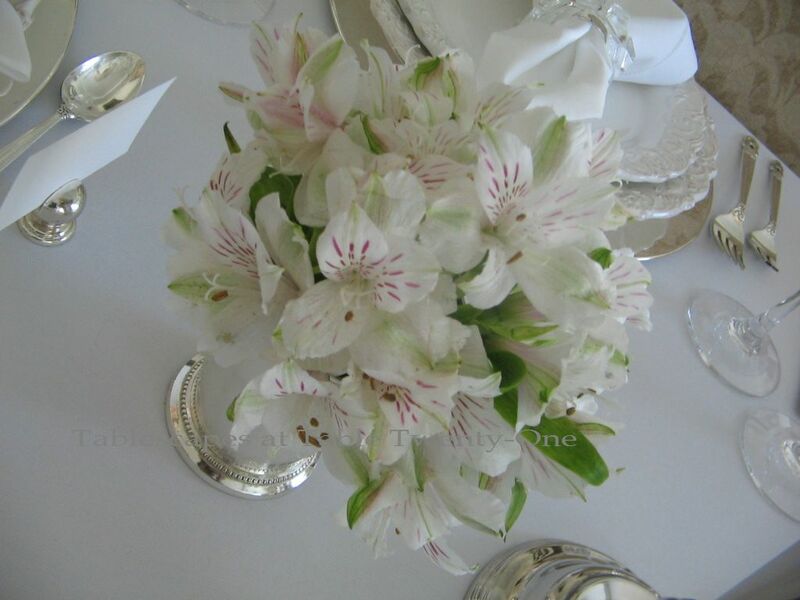 If Christmas broke the bank for you, alstroemeria is a good economical flower choice. Here, a single bunch from the florist is divided and arranged in classic silver julep cups. 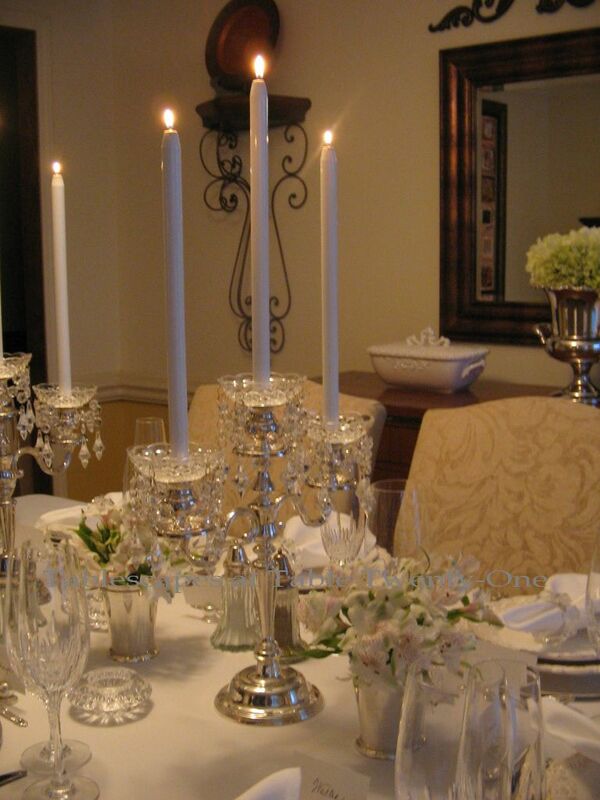 The clean, polished look is finished off with scattered cut crystal votives. This look is also appropriate for a bridal shower, rehearsal dinner, adult birthday or a little something special on Christmas Eve. I love this table. I have been trying to come up with something and your setting has given me a lot of great ideas! I think I will also use white dishes; now to iron the thrifted white tablecloth and polish the silver platters I’ll use as chargers…. OK, just went back and read the post about the candles…YIKES! Glad there was a (somewhat) happy ending, and the loss was minimal…that is scary though. But this table is beautiful. I love those plates…something about those lovely scallpoed edges. And that sterling…just beautiful! Looks like a wonderful way to ring in the New Year! Elegant, stunning, and yet another beautiful masterpiece! Absolutely stunning! The clean, crisp use of white is very elegant. I just love looking at your magic! Have a safe and Happy New Year! Hi Alycia, the white look is definitely hot!! 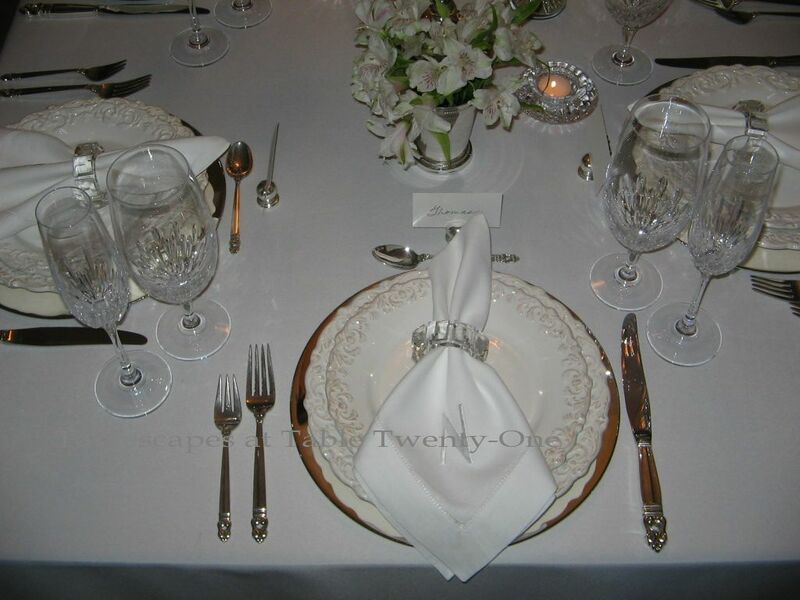 Very nicely put together, and the sterling flatware is just gorgeous. This is just “dripping” with elegance! Thanks for sending the cute email Christmas card, soooo adorable!!! Hope you and your family enjoyed the holidays. I’m feeling a bit “bloated”, will start a healthier regime Jan. 2nd!! Happy New Year, keep those tables a comin’!! Gorgeous Alycia! LOVE the white, silver & crystal combination for New Year’s! As always, I’m looking forward to seeing what you bring to the table in 2012! Wishing you a Healthy, Happy & Festive New Year! That is truly gorgeous! And it would be perfect for a bridal dinner too. Just so elegant ! I am still thinking about my NY table! I am still recovering from all the cooking I did for Cmas and the meals made for the kids to take away on their ski trip. 8 adults, 12 kids…that was a lot of food I made!